Why is everybody so gosh darn anxious to rule the world? I guess the pay and benefits would be awesome, but I can’t imagine there’s any time off. It would be high stress and thankless, well, unless you paid or forced people to thank you. And look at all the decisions you’d have to make; I don’t always know what I want for breakfast. Then there’s the meetings, slogans, pillaging, fear-mongering, plans, plots, the overthrowing, and feeling like you had to wear a fancy military-looking outfit and get giant pictures of yourself to hang up everywhere. Sounds monotonous and a lot of work. 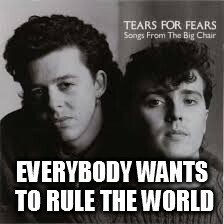 Tears For Fears might have been exaggerating, for effect, but humans do want what we can’t have. We can’t seem to help ourselves, it’s a yearning that lives deep inside us. We want what’s beyond our reach. It’s what makes us magnificent, but can be our Achilles heel. Terrorists, dictators, villains, supervillains, megalomaniacs with delusions of grandeur, evil scientists, and smarmy government types, admittedly, life could be boring without them, but wow, I’m willing to give it a try. Corporate types who are working so hard on helping everyone, even the homeless, to give their lives a purpose, maybe as a Wi-Fi hotspot, hybrid car/cellphone recharging unit, or solar panel holder. The sky’s the limit! Pirates and vikings, whom I suspect weren’t keen on hygiene, but apparently look like supermodels when portrayed on-screen. Supernatural beings and aliens seem to have an unnatural interest in ruling our world, hey, guys, go rule your own worlds! Laboratory mice whose genes have been spliced, oh, wait, that might have just been a cartoon. Presidential candidates, sure, let’s include Donald Trump. I wonder, will future GOP debates come with a warning label: Watch at own risk, to your brain. 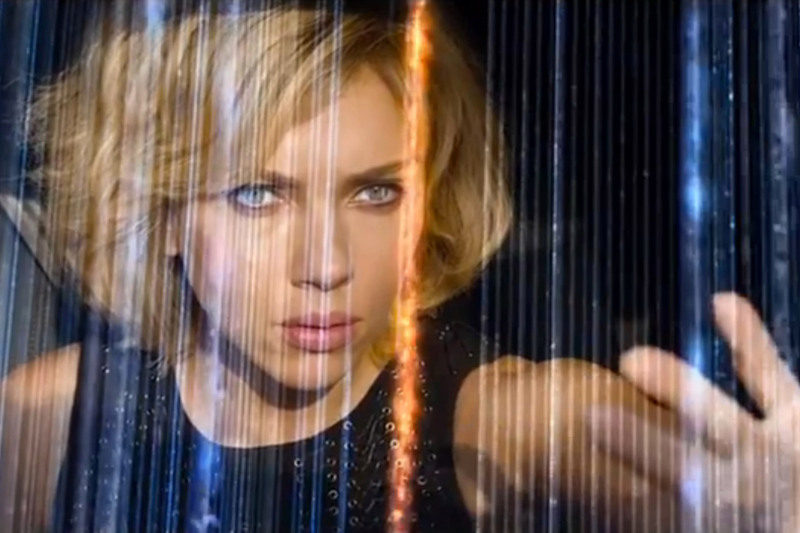 Criminals – I finally watched Lucy, unsure if it had a pro or anti-drug message, but there was a certain ‘be careful who you hang around’ feel to it. 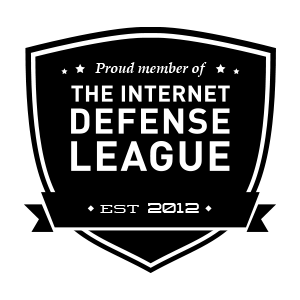 Hackers, who, for all we know, have tried to save us from some alien invasion or apocalypse and we’ve been all testy with them. Computer software makers who rule the world through versions, chat, and accessories. Leaders in dystopian futures – I just watched Insurgent and Hunger Games: Mockingjay Part 1 – definite everybody wants to rule the world vibes and songs. Cats and they’re doing a purr-fectly fine job. Vegetarians – unlikely world rulers, but sometimes we just want them to leaf us alone…see what I did there? Hunters, ok, the loss of Cecil the Lion was sad, but humans directly or indirectly kill animals, humans, and other forms of life on this planet everyday, right or wrong. Gamers, but at least they don’t care if it’s the real world. Don’t we all rule the world? You know, in that moment, that moment when you make someone’s day with a smile or kind word. Help someone. Do something you didn’t think you could do. Care. Answer that toy phone when a child hands it to you. Grow food instead of a portfolio. Don’t try to control, but to take part. Show patience, compassion, understanding. Offer help, comfort, support, or inspiration. Don’t give in to anger, greed, fear. To be part of something instead of needing to run it. Previous Post Shout! Shout! My 2 Year Blog Birthday! Let It All Out!!! So the minute I read the title of this post I had that song stuck in my head! Thanks for that lol!!! Love the end paragraph, it’s a wonderful way to think about it 🙂 And thanks for the earworm too – Happy Sunday! Ha ha, excellent 🙂 I have a vague memory of Schrodinger’s Cat, had to look it up to jog my musical memory bank. They were an interesting band weren’t they? Am I heading into ‘get off my lawn’ territory if I say there’s not much similar in popular music these days? I was thinking of applying to be Benevolent Dictator but I hopedwe couild make it a joint job so there’s always someone around for days off. I fear we have another year and a half of politics…ugh! You are always “spot on” Donna! Love the cat filing his nails 🙂 Have a great weekend! Our federal election is in 2 months, but the horror began long ago. I vote for cats to rule the world. Vegetarian cats, that is. Thanks Leigh for the Shout Shout comment. Now I have 2 Tears for Fears songs battling for control! 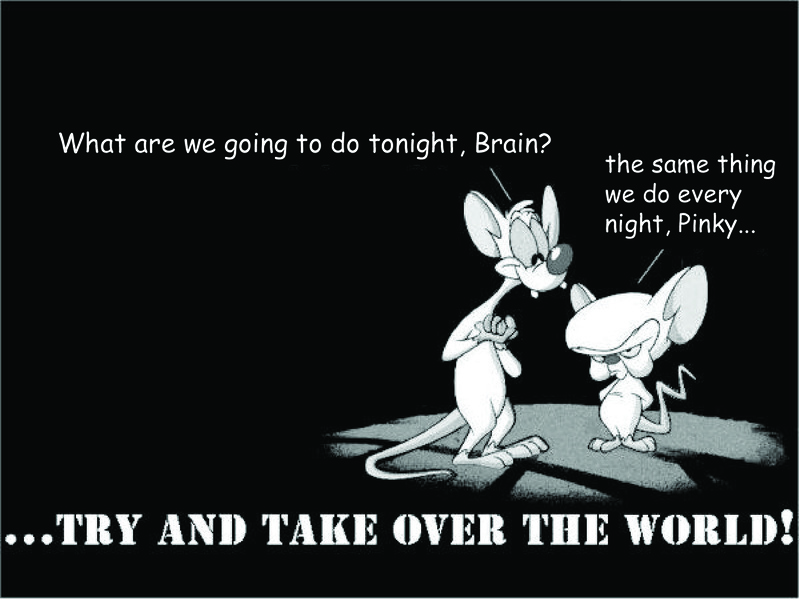 If Pinky and/or The Brain actually got to rule the world, I think I would actually be okay with that. Miss those two shows. Liked them better when it was just part of the Animaniacs, but still good on its own too. They really weren’t on long enough, either. I for one don’t wanna. By the way you did forget to mention me, I will be the president of the world pretty soon, and I do have some great ideas as to how the world should function. Yay! Grow food not a portfolio. I’m off to pick a courgette. Oh wait. vegetarians are out to get us – help! Lovely post Donna as usual brain achingly funny and thought provoking. I’m a vegetarian, so I suppose I ought to feel insulted. I do grow my own food, though. Pirates and Vikings would be VERY keen on hygiene for a bunch of reasons. Not the least of which is the close quarters. Bathing is not optional in a prison or on a boat. They would throw you in a bath or throw you overboard. Also, the element of surprise is lost if you can smell them upwind long before you saw them coming. I thought this was a great post and I had to share it with all of you. Is this too good or what! Spot-on with your thoughts. I want to get away from it all these wanna-be’s and crawl under a rock – seems like no one wants to grow up these days. 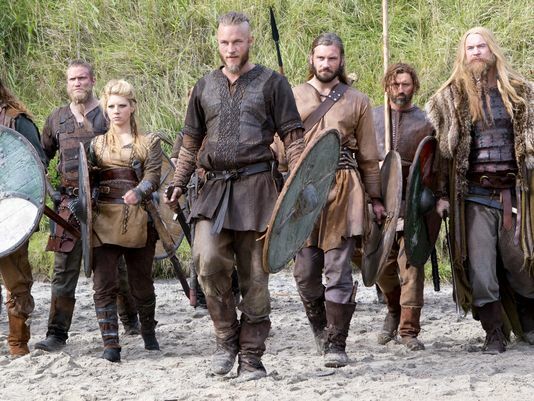 Viking photograph = perfection. I can genuinely say that I don’t want to rule the world…or do I? Perhaps I do want to be in charge of my own little world…and it might be the desire for control which matters, regardless of the size of the kingdom we wish to rule…. Aaaah, wise words, who’s to say which world we wish to rule. So good. And I will happily leave the world-ruling to someone else, for sure! I don’t feel a need to rule the world outside, I have more than enough to do by trying to rule my own world. You are right, it would be better, if we instead said, how can I help others? I’m reading “the game of thrones and philosophy” and the author points out that everyone is trying to win the throne but no one seems to be too happy either when they are fighting for it or once they get it. Heavy is the head that wears the crown, I suppose…be careful what you wish for, plot for, fight for. I love the ‘And Philosophy’ series from Open Court, really makes you think, that sounds like a good one. Everyone wants to rule the world is so close to the Truth it is unreal as the world changes your post represents the ying and yang of life. We may go backwards but we are still going forwards and at same time standing still as we are but a second in time. Plotting, fear-mongering, creating slogans etc. all in a day’s work, but more meetings???? Guess I’m not cut out for megalomania after all. True!! If we do wanna rule the world, we should treat it with care and love. An absolutely thought provoking post! Please do check out my blog as well! Speak of the devil, I just published a post on Donald Trump, in which Gertrude Stein went looking for him, but…. well, I hope the rest is as interesting as your post, should you care to give mine a look. Your writing is phenomenal. I love what you write. Great work. I’d be glad if you could visit my blog too. I’m glad I found someone as talented as you. I look forward to learn heaps from/of you. I’m not! But I completely agree with you. Personally, I’d be perfectly happy teaving it up to Tears. I don’t know if we can all rule THE world, but we can choose to rule OUR world and if everyone did a good job of that, we wouldn’t need anyone to rule THE world. (Just thinking out loud). The end paragraph pretty much sums up what it should really be all about! I cleaned my apartment today. That’s kind of like ruling the world. (At least I’m ruling my own world.) My cats don’t seem to agree though. That’s quite the list! I forgot about Pinky and the Brain. As a Wisconsin gal, I’m more worried about Scott Walker ruling the world. Erg. Hopping over from Susie’s blog! Thanks for sharing your blog link. Happy 2 year blogiversary! I can see how that’s a serious concern. If you believe everything that the media publishes there are a number of factions vying for the position of rulers of the world.. As Donna Parker identifies there is some disparity about the benefits of any of them achieving that power..Great post.. personally I think it is the media winning this election by posting stories that herd is into a collective voting for ‘acceptable’ alternatives who are taking us down the rabbit hole with Alice. Thanks for the reblog and I have to agree with you, with elections on both sides of the border. When I saw the title to this post the song immediately popped up in my mind :-). I agree, we all rule the world. One step at a time, one smile at a time and one good deed at a time. I’ve got enough to do. Can’t imagine wanting to “Rule the World.” Great post-hoping Trump reads it! Lol. Oh, can’t keep up as it is. Lots of interesting points in your post! Yeah, it is the kittens who are really running this show. That cat filing his nails is just amazing! I don’t want to rule the world, because it would be frightening—-especially for the richest 1%. In fact, if I reluctantly became the world’s leader, I’d make sure to have an annual culling of the top 1% starting with everyone on the current Fortune 400 list my first day in power. Then instead of lying and cheating to become a member of the oligarchs, people at the top would be frantic to lose their wealth before the next annual culling day. he wealthiest 1% will soon own more than the rest of the world’s population, according to a study by anti-poverty charity Oxfam. The charity’s research shows that the share of the world’s wealth owned by the richest 1% increased from 44% in 2009 to 48% last year. Global private financial wealth grew by nearly 12 percent in 2014 to reach a total of $164 trillion. The 1% holds $78.72 Trillion of that $164 Trillion. Frightening and so stupid, it doesn’t make any sense. I’m not a religious person but I think the Bible offers some good advice, and the Bible has 57 Bible Versus about Greed. All of this was talked about around campfires thousands of years ago, and then written down. Evidently the greedy have not learned a thing. Yes, and it becomes even more obvious in politics, for example, we have a Federal election here in Canada and it’s all about buying votes, it’s so wrong, it’s literally sickening. What good would money be if you know others are suffering, struggling, even dying just because they don’t have food, shelter, safety, medicine? It’s so silly and sad. What an amazing post. Loved it. You are so cynical and then so wonderfully hopeful at the end. I totally agree. A nice combination of joy and hope. Once I “lost” my husband, house and professional job in one year I had a great friend and dear mentor who was only 40 while I was 50 who got cancer and died. Nothing seems insurmountable now, D.
do, I think small favors, paying forward and smiling even if you are having a bad day makes a huge impact in your pathway through life, one moment at a time. Like those little droplets which make ripple circles widening ever so slowly until reaching across oceans and continents. Fantastic way to start the ripple effect going from your corner. . .
I’m sorry to hear about those losses, that must have been an extremely difficult time. They say fire tempers steel, but sometimes I’d rather not have to be tempered quite so much, I’m sure you agree. I just saw Tears For Fears in concert last weekend, along with Hall and Oates. Because old. They still sounded great. We have a chihuahua who wants to rule the world. Love the message of this post. My dog seems to rule my world! Great post! Thanks for sharing at The Bloggers Pit Stop! I have been listening to lots of 80’s music lately. Your title caught my attention with the Tears For Fears reference. ❤ I especially like the last paragraph of this post. A show of support can go a long way. It was a magnificent era for music, wasn’t it? Just when I think #TrafficJamWeekend can’t get any better I find my post featured and I’m even happier! Thank you kindly. I love this linky party, I don’t know how you all do it every week, but I’m so so so glad you do, it helps bloggers connect and in this giant virtual haystack that is a gift.